Ms. Chigiano L.VIII.296. Biblioteca Apostolica, Vatican. The Chronicle depicts scenes from the history of Florence. This miniature represents the Conquest of Fiesole. The miniaturist followed French examples. 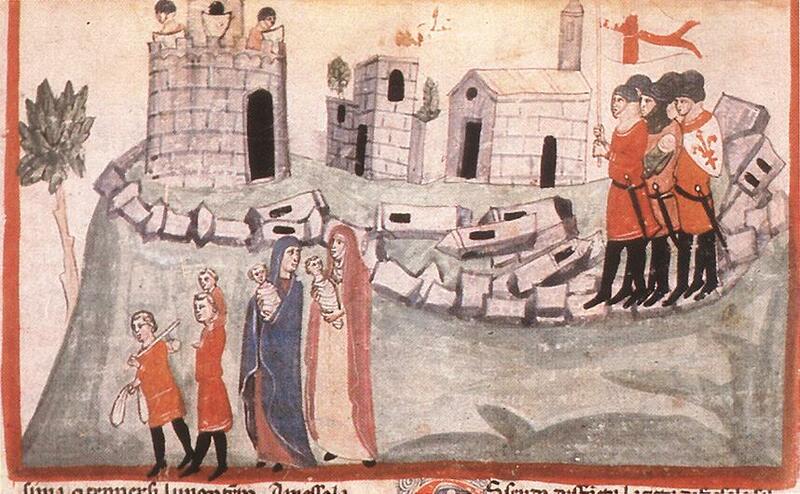 1010 a.d. BOOK IV. § 6. — How in the time of the said Henry, the Florentines took the city of Fiesole, and destroyed it. In the said times, when the Emperor Henry I. was reigning, the city of Florence was much increased in inhabitants and in power, considering its small circuit, especially by the aid and favour of the Emperor Otho I., and of the second and third Otho, his son and grandson, which always favoured the city of Florence; and as the city of Florence increased, the city of Fiesole continually decreased, they being always at war and enmity together; but by reason of the strong position, and the strength in walls and in towers which the city of Fiesole possessed, in vain did the Florentines labour to overcome it; and albeit they had more inhabitants, and a greater number of friends and allies, yet the Fiesolans were continually warring against them. But when the Florentines perceived that they could not gain it by force, they made a truce with the Fiesolans, and abandoned the war between them; and making one truce after another, they began to grow friendly, and the citizens of one city to sojourn in the other, and to marry together, and to keep but little watch and guard one against the other. The Florentines perceiving that their city of Florence had no power to rise much, whilst they had overhead so strong a fortress as the city of Fiesole, one night secretly and subtly set an ambush of armed men in divers parts of Fiesole. The Fiesolans feeling secure as to the Florentines, and not being on their guard against them, on the morning of their chief festival of S. Romolo, when the gates were open, and the Fiesolans unarmed, the Florentines entered into the city under cover of coming to the festival; and when a good number were within, the other armed Florentines which were in ambush secured the gates of the city; and on a signal made to Florence, as had been arranged, all the host and power of the Florentines came on horse and on foot to the hill, and entered into the city of Fiesole, and traversed it, slaying scarce any man, nor doing any harm, save to those which opposed them. And when the Fiesolans saw themselves to be suddenly and unexpectedly surprised by the Florentines, part of them which were able fled to the fortress, which was very strong, and long time maintained themselves there. The city at the foot of the fortress having been taken and overrun by the Florentines, and the strongholds and they which opposed themselves being likewise taken, the common people surrendered themselves on condition that they should not be slain nor robbed of their goods; the Florentines working their will to destroy the city, and keeping possession of the bishop's palace. Then the Florentines made a covenant, that whosoever desired to leave the city of Fiesole, and come and dwell in Florence, might come safe and sound with all his goods and possessions, or might go to any place which pleased him; for the which thing they came down in great numbers to dwell in Florence, whereof there were and are great families in Florence. Others went to dwell in the region round about where they had farms and possessions. And when this was done, and the city was devoid of inhabitants and goods, the Florentines caused it to be all pulled down and destroyed, all save the bishop's palace and certain other churches, and the fortress, which still held out, and did not surrender under the said conditions. And this was in the year of Christ 1010, and the Florentines and the Fiesolans which became citizens of Florence, took thence all the ornaments and pillars, and all the marble carvings which were there, and the marble war chariot which is in San Piero Scheraggio in Florence.